Redbud Farm is approximately 50 acres. We own about 30 and we lease another 20 from a neighbor. The back 20 acres is used for retired, laid up, or young horses. The front 13 acres is used exclusively for broodmares and foals. The remaining 27 acres has the barn, three smalls paddocks, and wide open spaces for riding and turning out the herd. This seems like a lot. Especially to a girl from the suburbs of Boston, such as myself. It certainly keeps us busy. Mowing, spraying, weed eating and fixing fence lines, dragging paddocks… the list goes on and on. The farm has 17 stalls. This includes the mare and foal stall. Horses need somewhere between 3-5 acres of grazing land per horse. Despite still being a lot of work, 50 acres becomes a very small amount when you do the math. On top of all this, Mississippi’s climate is miserable. I grew up with the sticky summers and cold snowy winters of Massachusetts, but Mass seasons can't hold a candle to the hot humid Mississippi summers with no rain and the grey wet winters where is rains non-stop. Between summer and winter there is a short reprieve when the weather it truly pleasant. When Betsy moved into Redbud Farm in 2004, the grass was thick and lush and knee high. In the winter, grass died. Horses ate anything they could find down to the roots and tore up the wet ground. The fields got boggy. In the spring, grass couldn’t grow because their root systems had been damaged. That which did sprout was immediately eaten preventing it from establishing itself. Weeds took over and in turn chocked out grass. When summer rolled around there was sparse grass to protect the soil and it baked; grass withered and died. Then the entire cycle started over again. 10 years of over grazing, riding, turning out in the winter, and not resting the paddocks has render the fields bare and the ground compacted into concrete. Over the last three years, Betsy and I have tried to rejuvenate the pastures. Unfortunately, this means we have to sacrifice some areas to overgrazing and mud. It also means horses have to be restricted to a smaller area without grass for long periods. Although they have as much hay as they want, the horses are not as happy when they're grazing. When the ‘winter' weather begins in October, we remove horses from the ‘big world’. They go out in a dry lot with hay. Dry lot turn out last until December when we leave for Florida. This is one of the many benefits of going south; the horses can have proper turnout and our fields still rest. In mid-March when we get home, the horses continue to get turned out in the dry lot. The grass is coming on but it is still too fragile, and the ground is still too wet to handle horses. We use this time to spray weeds and mow. This isn’t ideal for many reasons, but it means that in May, assuming the ground is dry and the grass is grown up enough, the horses can start going out in the ‘big world'. May, June, and into July the horses graze, the grass gets eaten down but still lives. End of July, August, and September the rain stops, the ground gets hard, and the grass dies. Horses still graze but we have to supplement with hay. By October it’s time to take the horses off the field again and let it rest for next year. The grass is coming back little by little. If we didn’t do this, there would be no grass. Obviously this means no grazing for the horses. However, no grass also makes riding tough. With no grass to protect it, the ground becomes hard in the summer and swampy in the winter. 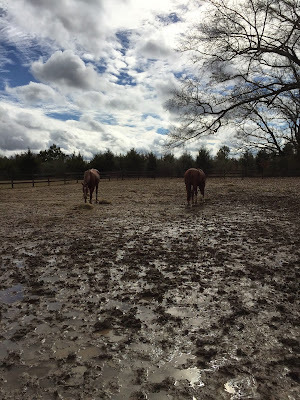 Both conditions leave the footing slick and horses susceptible to injury. Having horses is more complicated than I ever imagined!